You can make a garden variety anchor link (<a>) open up a new email. Let’s take a little journey into this feature. It’s pretty easy to use, but as with anything web, there are lots of things to consider. But we immediately run into a handful of UX issues. One of them is that clicking that link surprises some people in a way they don’t like. Sort of the same way clicking on a link to a PDF opens a file instead of a web page. Le sigh. We’ll get to that in a bit. “Open in new tab” sometimes does matter. If a user has their default mail client (e.g. Outlook, Apple Mail, etc.) set up to be a native app, it doesn’t really matter. They click a mailto: link, that application opens up, a new email is created, and it behaves the same whether you’ve attempted to open that link in a new tab or not. But if a user has a browser-based email client set up, it does matter. For example, you can allow Gmail to be your default email handler on Chrome. In that case, the link behaves like any other link, in that if you don’t open in a new tab, the page will redirect to Gmail. I’m a little on the fence about it. I’ve weighed in on opening links in new tabs before, but not specifically about opening emails. I’d say I lean a bit toward using target="_blank" on mail links, despite my feelings on using it in other scenarios. This is somewhat rare to see for some reason, but mailto: links can define the email subject and body content as well. They are just query parameters! You can send to multiple email addresses, and even carbon copy (CC), and blind carbon copy (BCC) people on the email. The trick is more query parameters and comma-separating the email addresses. mailtolink.me will help generate email links. I’m not sure how useful this is, but it’s an interesting curiosity that you can make a <form> do a GET, which is basically a redirect to a URL — and that URL can be in the mailto: format with query params populated by the inputs! It can even open in a new tab. Because mailto: links are valid anchor links like any other, they are typically styled exactly the same. But clicking them clearly produces very different results. It may be worthwhile to indicate mailto: links in a special way. 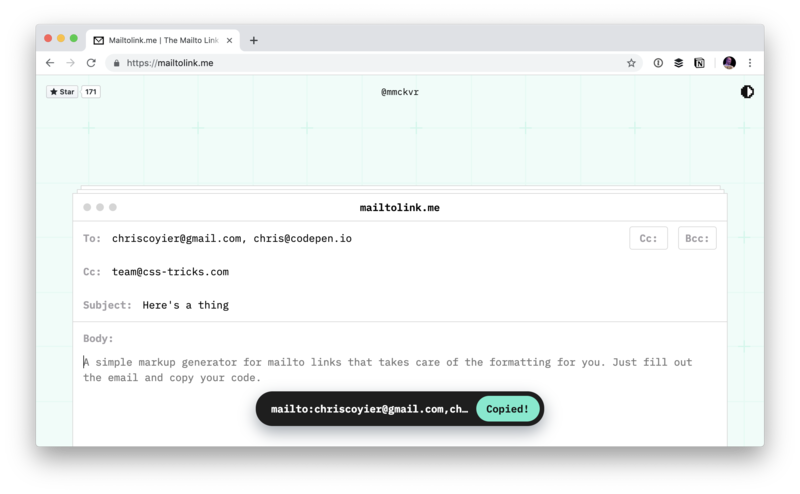 If you really dislike mailto: links, there is a browser extension for you. I dig how it doesn’t just block them, but copies the email address to your clipboard and tells you that’s what it did. The post All About mailto: Links appeared first on CSS-Tricks.